Lloyds Leda Quintuple outfit is mounted with a golf course frame, which is so named because it follows any undulation on a golf course but is equally at home on sports fields and other grass areas. 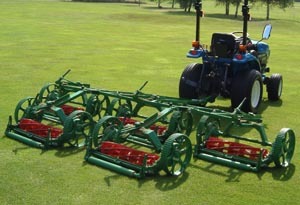 Fitted Leda Standard 760mm gang mowers with a 4, 5, 6 or 9 bladed cutting cylinders or Giant 6 bladed cutting cylinders, and a choice of cast SG iron wheels or pneumatic wheels. The two outer wings can be disconnected and the outfit used as a Trio if required. An optional frame with lifting wings can be used to aid transport along roads and through gateways and over bridges.